Your audience is never more primed to share content than when they’re “in the moment” at an event, on location or while experiencing your brand. In this article I’ll show you four ways you can use visual content to motivate real-time interaction. If you want fans to take an action (e.g., share an image, post a picture or enter a contest), you need to tap into the moments when they’re most likely to do it. And those moments are usually during an event, not after. 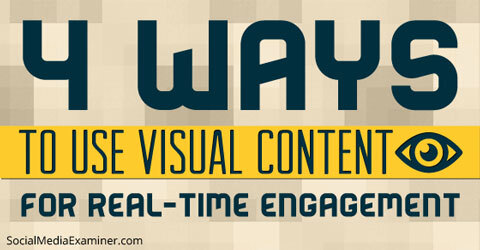 Find out how to use visual content for real-time engagement. People aren’t likely to share when the excitement is over and they’re back home on their computer faced with more deadlines and too much content to sift through. Here are four ways you can tap into real-time experiences to engage your audience with visual content and encourage them to take action. Do you have a physical place of business? There’s no better time to ask someone to share visual content about you than when they’re on location experiencing your brand. The 1888 Hotel in Sydney has been dubbed the “World’s First Instagram Hotel” because the staff actively encourages guests to document their stay in real time via Instagram. A fitting title for a hotel named 1888—the same year Kodak’s Box Roll camera was released to the market. 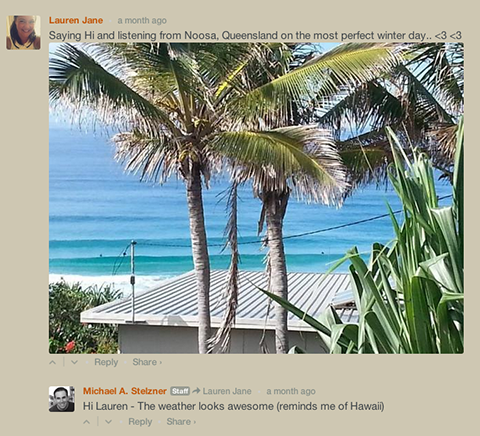 The hotel uses everything at their disposal to motivate people to share as much visual content as possible. They have a custom hashtag, a fun place for selfies, iMacs with featured photos, photo walks and Wi-Fi and iPads in every room for frictionless sharing. As soon as guests arrive at the hotel, they can start their visit by taking a fun selfie. 1888 Hotel features a selfie space with classic picture frames ready for Instagram action. 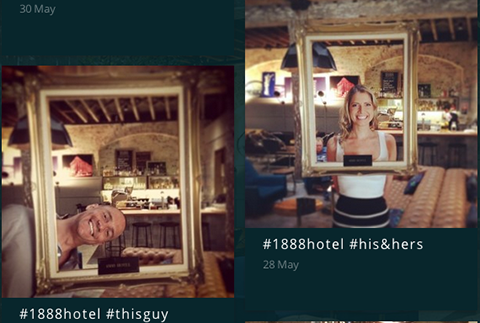 Guests at 1888 Hotel can’t resist the selfie corner and love getting creative with hashtags. 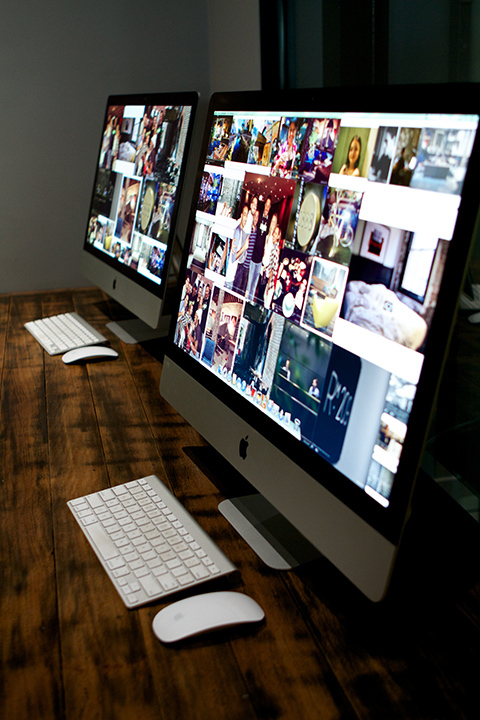 The hotel encourages guests to tag their photos with #1888hotel so they can see their photos streamed live to two iMac computers in the lobby, as well as on the hotel’s website. The hotel encourages even more participation by choosing a photo of the month and rewarding the photographer with a free night’s stay. Guests love seeing their images showcased on the two iMacs in the lobby. But why stop at hotel selfies? 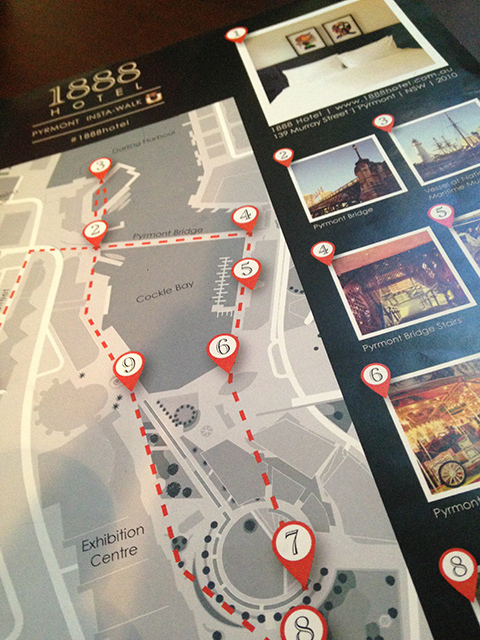 1888 Hotel worked with local bloggers to develop an Insta-walk that showcases the most “Instagrammable” locations in the local Pyrmont and Darling Harbour area. Guests are encouraged to take the walk during their stay and share images to Instagram (with the hotel’s #1888hotel hashtag, of course). Got some time before your room is ready? Take a stroll with Instagram! The Insta-walk is a brilliant idea because guests don’t just use the hotel hashtag in their photo captions, they also use other popular Australian travel hashtags, resulting in further exposure for the hotel. 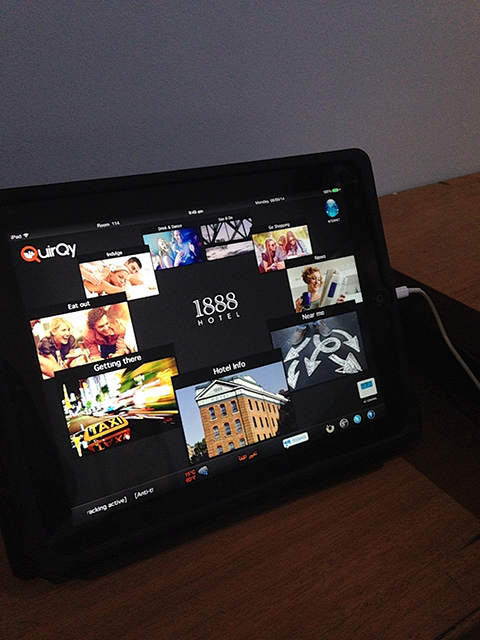 Wi-Fi is paramount to frictionless sharing, so the 1888 Hotel provides free Wi-Fi in the lobby and guestrooms. But they take it one step further than most businesses: They provide access to an iPad in every room, complete with social sharing functionality, ready to go. Take every opportunity to make it easy for your audience to share in real time. 1888 hotel doesn’t do any advertising, relying solely on social media and earned media (free PR). As such, 1888 Hotel is a great example of the power of real-time visual content. If your business is completely online, you can still ask fans to share visual content about where they are and what they’re doing at a particular moment. For example, podcasts are entirely audio, but with a little creativity, hosts can incorporate visual content in fun ways. You’re most likely familiar with Mike Stelzner’s Social Media Marketing Podcast if you follow this blog. Recently Mike ran a contest to win a copy of his book Launch and 30 minutes of “ask me anything” Skype time with him. Even if your business is digital only, you can motivate fans to share pictures. Sometimes asking your fans to share is all it takes to get a new kind of interaction and draw attention to your business. Make sure you ask everyone to use a specific hashtag so you can track the engagement and respond in real time. It’s hard to plan memorable moments. They just happen. Be ready to respond quickly to unexpected events because your timing is part of creating awesome content that fans want to share while the event is still happening. Remember the famous 2013 Oreo Tweet? Ad agency 360i took just 5 minutes to conceptualize, design and caption the image that was tweeted worldwide just 10 minutes after the power went out at the Super Bowl. Oreo set the bar for rapid response with visual content—the tweet was a hit and the online chatter continued overnight. Being a first responder with visual content can massively increase your chances of engagement. Fans look to join in on the conversation as it happens. Prepare to lead or join conversations that are popular with your community by planning targeted content ahead of events. Dunkin’ Donuts does this extremely well—so well, in fact, they’re often referred to as the brand that hijacks events with content, whether it’s the World Cup or the Grammy Awards. The good news is that any business, no matter how small, can identify the events customers are most interested in and then post about them. Plan ahead! Make and share an engaging image related to a current event. 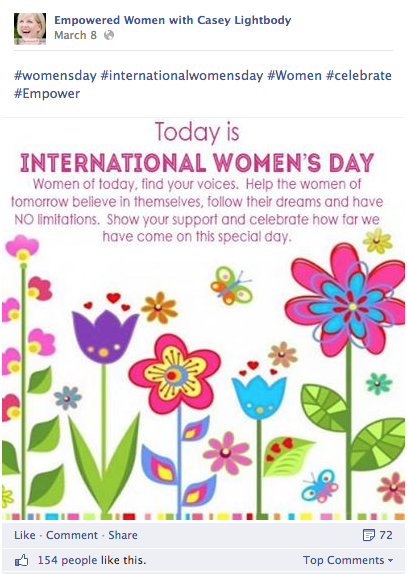 Even though hers is a relatively new business page, Casey was able to achieve a significant number of shares. Why? Because marketers in the same niche are looking for content to post every day. If you produce an image that appeals to your target audience, other businesses with a similar audience will often share it. This is especially true if those other businesses are waking up on the day of an event or celebration and don’t yet have anything scheduled. 1. Provide Wi-Fi. Wi-Fi = Easy sharing of visual content. If you’re concerned about cost, cap the MB usage per day or person, but don’t let cost hold you back from offering free Wi-Fi. 2. Ask people to share. It’s that simple. Ask your fans to share a picture of themselves—where they’re listening to your podcast, what they’re doing this weekend or where they’re reading your blog. 3. Prepare your toolbox. Use tools like Canva, PicMonkey or WordSwag. Become familiar with their templates and tools so you can quickly make an eye-catching image for a last-minute post or a response to an event. 4. Plan ahead. Get out your calendar and write down the dates for every celebration or event that’s relevant to your industry, including national and international events. Then think about ways you can have content ready to schedule for those events. 5. Research the situation. Oreo finished their famous tweet in 5 minutes but didn’t post it until 10 minutes after the lights went out at the 2013 Super Bowl. Why? Because they checked to see that everyone was safe first and made sure it was just a blackout and not something more serious. If you schedule a post for an event, be ready to react to any news in the media, whether related to that event or not. If circumstances change, perceptions may change. Use common sense when posting and be prepared to respond in real time. Your fans are more motivated to interact with your brand when they’re in the sweet spot—the real-time, in-the-moment experience. Ask for photo shares when they’re already excited or interested in your business. Provide fans with the means to share easily and without having to think too much by being very clear about what you want them to do, providing relevant hashtags or tags that you want them to include and providing free Wi-Fi. What do you think? How are you using images to motivate real-time engagement? Do you ask your audience to share visual content? I would love to hear your thoughts. Please leave your comments below.